The “business as usual” scenario for most cities in India involves utilization of fossil fuels (diesel and CNG) for bus transit. Electric mobility is a potential solution to reduce the carbon footprint of city public transport. This paper analyzes the feasibility of this and computes the life cycle cost (LCC) of the procurement and operation of electric as opposed to diesel buses based on a functional unit of one bus driven 100 km per day. The research indicates that the total cost of ownership (TCO) of an electric bus, calculated over a life cycle of 25 years, is 5-10% less compared to a diesel bus. Sensitivity analysis is performed for the TCO of the electric bus in order to prepare a robust case to accommodate market fluctuations and the research assumptions. Component-wise analysis indicates several potential measures that may be taken to improve the viability and feasibility of electric buses. The research goal is to enable decision-making on the adoption of electric mobility by respective urban local bodies. This would promote the use of sustainable transport in urban localities and would also help in reducing the carbon footprint. The transportation sector in India is a significant contributor to the deteriorating urban air quality and human health. More than 50 cities in India have a population greater than one million, all of whom are subject to transport sector emissions. This is because the “business as usual” case for the cities involves use of fossil fuels (e.g. diesel and CNG) for transportation. There is an established need for energy conservation, energy security (reduction in fossil fuel dependency), an improved carbon footprint (reduction in greenhouse gas emissions) and improved air quality (a reduction in other pollutant emissions). The goal of this research is to synergize electric mobility for bus transport in Indian cities. The case of pure electric buses (zero emissions) is considered for implementation, together with life cycle cost assessment (LCCA). The life of road-based infrastructure projects in India is close to 25 years and therefore the analysis is conducted based on this life span. The functional unit used for arriving at the life cycle costs and comparative assessment is one bus travelling 100 km a day. LCCA and net present value (NPV) with internal rate of return (IRR) computation are two vital decision-making tools which can be applied for the feasibility analysis of a complex infrastructure project. 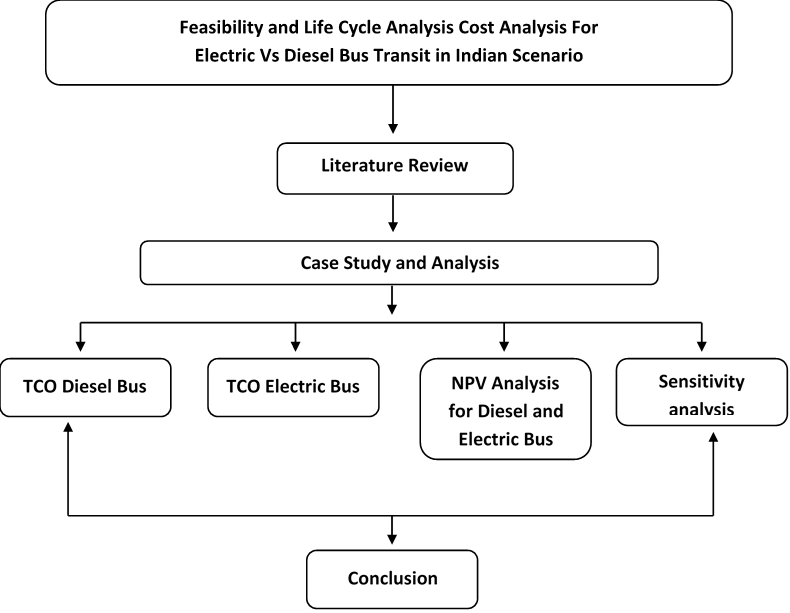 The primary objective of this study is to compare the life cycle cost analysis for an electric bus compared to a diesel one through tools such as total cost of ownership (TCO) and net present value (NPV) analysis and to analyze the feasibility of using electric buses as a sustainable transport mode for mass rapid transit systems (MRTS). Both TCO and NPV analysis are performed for the functional unit of one bus for 100 km trip length. The analysis is predominantly based on the assumptions of cost data, which inherently vary depending on market and policy fluctuations. In order to make a more robust analysis, the sensitivity of various data parameters to the TCO is evaluated and presented in a later section. A secondary objective is to obtain an insight into the external costs of pollution associated with electric and diesel buses. The research has explored the life cycle costs involved in the procurement and operation of electric buses as opposed to diesel buses through TCO calculations and NPV analysis. It contributes to the academic and professional world in terms of creating awareness of the long-term benefits of using electric vehicles. The research also contributes towards identifying the niche cost components, which need to be addressed for the promotion of electric vehicles. According to the analysis, it was observed that when evaluated over a life cycle of 25 years, which is the normal life of transport infrastructure such as pavements in India, the TCO for electric buses (INR 36.6 million, or USD 571,875) is significantly lower than that of diesel buses (INR 39.1 million, or USD 610,938) even if the external costs of pollution are ignored. This trend is also supported by the NPV analysis, in which the electric bus option NPV (INR 26.2 million or USD 409,375) is significantly cheaper than that of the diesel bus NPV (INR 32.3 million or USD 504,688). Electric buses, although involving a high capital expenditure (two to three times that of diesel buses), have much lower recurring costs and seem to be feasible in light of long-term benefits. The TCO is most sensitive to the bus cost and therefore alternative funding mechanisms for the capital expenditure are identified as an urgent need for intervention. There is also a considerable component of financing costs involved with electric buses (almost a quarter of the TCO) and therefore this should be looked as an opportunity to make it further viable by introducing soft loans or alternative financing mechanisms. The savings in operational cost are the most promising part of the electric bus TCO. These savings can be invested to enable phase-wise procurement for the next set of buses. Overall, it can be inferred that electric bus mobility is a promising initiative for Indian cities and can be a beneficial investment considering long-term value. A 5-10% life cycle cost benefit is expected by deploying electric buses instead of diesel ones for a functional unit of 100 km daily trips. For the assumed functional unit, minimum savings of INR 25,000 (USD 391) per bus per km are expected for electric buses over diesel ones, given that the trip length is at least 100 km. It should be noted that the longer the trip length, the greater the savings in operational costs and therefore longer routes yield better TCO benefits compared to shorter ones. Therefore, considering long term benefits, electric buses appear to be quite a feasible option as a mode for sustainable transportation over other conventional fossil fuel- based modes of public transport. For future research, it is recommended that similar studies based on computation of TCO are conducted for other modes of fuel technology, such as bio-diesel buses, hybrid-electric buses and hydrogen fuel cell buses. Detailed cost-benefit and value engineering analysis can be made to further validate the feasibility of electric and diesel buses. The authors acknowledge the co-operation of the transportation authorities of Ahmedabad and Bangalore in providing the necessary data to carry out this research work. No conflict of interest has been reported in the research.